This science page presents the cumulus cloud, the puffiest, fluffiest kind of cloud that's made for playing outdoors under. If we could look at the sun, what colour would it be? Your child can decide with this sun coloring page, the perfect way to introduce her to astronomy! Discover the many different kinds of conifer and deciduous trees as you complete this word search! Did you know that trees have more parts than just the trunk, branches and leaves? Take a look on the inside of a tree with this fill-in-the-blank diagram! Introduce your little astronomer to Earth's 'sister planet' Venus! He'll colour the picture as he learns fun facts about our solar system's brightest planet. Blue whale facts include that calves weigh up to three tons at birth and adults can be as heavy as 200 tons. Get other cool blue whale facts on this worksheet. Does your second grader love farm animals? This easy writing exercise will help your child be more observant about tracks left by some familiar animals. Where Else Can We Find Soil, Sand and Dirt? Read the definitions given for soil, sand and dirt then write down where each element can be found below the pictures. Both of these animals have big ears! Your child will look at the pictures of unusual animals in this worksheet and try to learn some new things about them. Studying earth science? Learn about the different types of clouds with the series of cloud types. Animals need to adapt to survive! Teach your child how some animals can blend with their surroundings using camouflage. Little space explorers, meet Mercury, the closest planet to the sun! This planetary coloring page comes with some fun facts about Mercury. Little outer space explorers, welcome back to our home planet: Earth! Help your child read a few fun facts about planet Earth with this coloring page. 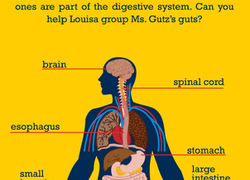 Help your child learn about the nervous system and the digestive system with this fun worksheet, which will challenge his knowledge of physiology. Download this worksheet for answers to our animal reading comprehension series. With this diagram, kids can find out more about oil, one of our most widely-used natural resources, and learn a little more about where it comes from. From the blue whale to the Tasmanian devil, our planet is full of fascinating animals. Find a few of the most interesting ones in this animal word search.